Light waves traveling through fiberoptics may hold clues about how solitary, towering “walls of water” known as rogue waves form in the ocean. For the first time, scientists observed a few giant, solitary pulses of light — optical rogue waves — appearing amid thousands of smaller light waves. Sailors’ tales of monstrous ocean waves that swallow ships whole were once dismissed as the stuff of legend. In the past decade, however, satellite images and photographs of towering waves bearing down on ships and oil platforms in the ocean have shown that such “rogue waves” are indeed real — but because they are so rare, how these giant, solitary waves form is still a mystery. But by using the movement of light waves through fiberoptics as a stand-in for the elusive ocean waves, scientists are gaining clues about what may drive these monsters of the deep. With little data about their occurrence in the open ocean, however, predicting when and where rogue waves might form is difficult. Open ocean observations — and therefore real-time data — are exceedingly rare. While scientists have also tried to recreate the waves in giant water tanks, that can also be time consuming, because even in the lab, the freak waves form so infrequently, Solli says. The similarities between water and light waves have long been known, he says, but “what wasn’t looked into was whether rogue waves could exist with light.” While studying how pulses of light travel through optical fibers, however, Solli’s team made a surprising discovery: Of the many thousands of light pulses measured in a moment of data capture, several of the pulses were inordinately large. The team realized that those similarities suggested that “optical rogue waves” could be a useful proxy for the waves’ formation in the ocean — and because the light waves are so much more frequent, they could provide thousands more data points in a few seconds than are observable in years on the ocean. To determine if rogue waves exist naturally in light as well as in water, the team first collected a large number of short optical pulses traveling through optical fibers that have nonlinear “microstructures” simulating the chaotic environment of the ocean. They then measured the waves’ heights and shapes. Outside of the expected statistical curve of thousands of wave shapes, several large, steep outliers appeared, they reported Dec. 13 in Nature. 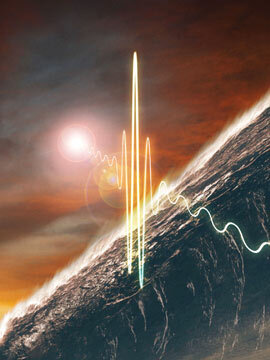 Those rogue optical waves, the team suggests, are associated with a well-known type of wave, called a soliton, that is found in light and ocean systems alike. Solitons are particularly useful in communications, because they can travel at constant speeds for some distance in solitary splendor without distorting their shape by flattening or spreading out — a useful property when sending data. In a “noisy,” chaotic wave system, whether water or light, solitons can form as the result of a complex interplay between the frequencies of many different waves and how swiftly they travel through their media. A pulse of light, for example, may consist of many different frequencies of light, all of which travel at different speeds. To complicate things, the speed of each frequency also depends on its amplitude. As a result, the light pulse containing all these different frequencies can change its overall shape over time as it travels along. But if it takes just the right shape, all of those different competing or reinforcing effects cancel each other out, and an unchanging soliton forms. After observing the large, solitary pulses of light, Solli and his team set out to try to recreate them, by simulating chaotic, nonlinear conditions in optical fibers. Adding even tiny perturbations to a system of smooth pulses, he says, appeared to open the door for “freak” events to occur. “Ocean and light waves are very sensitive to deviations from normal initial conditions,” and a small event — like the analogy of the butterfly flapping its wings — could have a dramatic impact on them, Solli says. “If you have a perturbation at the right frequency that occurs on the right spot on the pulse, it essentially ‘tickles’ the pulse.” Even a weak tickling can contain the seed of a dramatic impact on the pulse at a later time, he adds. “You have a redistribution of energy within the pulse,” which can ultimately lead to a wave that’s very sharp and very steep. One caveat to translating these optical rogue waves to the open ocean is that the two environments are far from identical, wrote physicists Dong-il Yeom and Benjamin Eggleton of the University of Sydney in New South Wales, Australia, in an accompanying Nature “News and Views” article. That means that identifying when and how such a “tickle” out in the ocean could generate a rogue wave still won’t be a simple matter. But, they wrote, the relative ease of experimenting with such waves in optical systems offers an intriguing new way to help shed light on an age-old mystery.